10.5x21.75x1 Odor Eliminator Air Filters - $12.66/ea. 10-1/2" x 21-3/4" x 1"
This is a non-standard size filter. The actual dimensions of the filter are 10.5" x 21.75" x 0.75". Please measure your existing filter before ordering to make sure it will be compatible. We recommend a MERV rating between 8 and 11 for most residential furnace and AC units to adequately remove airborne contaminants. Filters with a higher MERV rating must be replaced at least every three months to avoid restricted air flow and negative effects on your furnaceâ€™s performance. 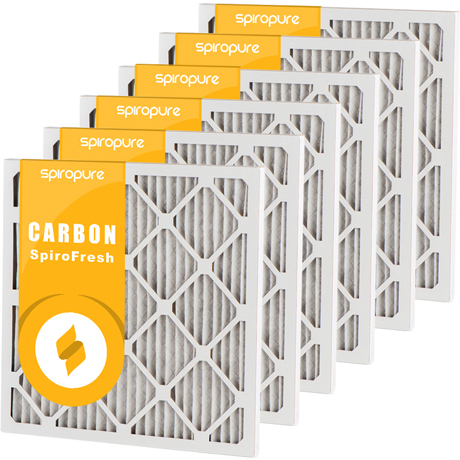 Air filters use two sets of dimensions: actual and nominal. The actual dimensions are the exact height, length, and width measurements. Most filters are sold under nominal dimensions, which are rounded off to the nearest 1" measurement. For example, if your air filter measures 10 Â½â€œ x 20 Â¾â€ x 1Â¼â€, the nominal dimensions will typically be 11â€ x 21â€œ x 1â€. To find your filter size, we recommend measuring the actual dimensions of your existing filter and choosing the closest match in nominal dimensions.